Dynamic Host Configuration Protocol (DHCP) failover in Windows Server 2012 is a new method for ensuring continuous availability of DHCP service to clients. This guide provides step-by-step instructions for deploying DHCP failover in a test lab using two server computers and one client computer. Software and hardware requirements are provided, as well as an overview of DHCP failover. In Windows Server® 2008 R2, there are two high availability options available for DHCP Server deployment. Each of these options is associated with some challenges. DHCP in a Windows failover cluster. This option places the DHCP server in a cluster with an additional server configured with the DHCP service that assumes the load if the primary DHCP server fails. The clustering deployment option uses a single shared storage. This makes the storage a single point of failure, and requires additional investment in redundancy for storage. In addition, clustering involves relatively complex setup and maintenance. Administrators can deploy DHCP servers running Windows Server 2012 as failover partners in either hot standby mode or load sharing mode. In hot standby mode, two servers operate in a failover relationship where an active server is responsible for leasing IP addresses and configuration information to all clients in a scope or subnet. The secondary server assumes this responsibility if the primary server becomes unavailable. 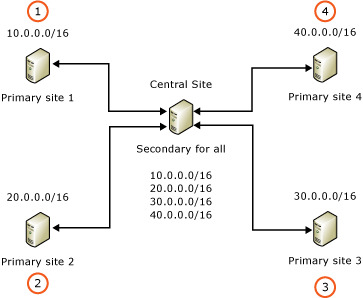 A server is primary or secondary in the context of a subnet. For instance, a server that has the role of a primary for a given subnet could be a secondary server for another subnet. Hot standby mode of operation is best suited to deployments where a central office or data center server acts as a standby backup server to a server at a remote site, which is local to the DHCP clients (ex: hub and spoke deployment). In such deployments, it is undesirable to have a remote standby server service any clients unless the local DHCP server becomes unavailable. The figure below is an example of a hub and spoke deployment. In a load sharing mode deployment, which is the default mode of operation, the two servers simultaneously serve IP addresses and options to clients on a given subnet. The client requests are load balanced and shared between the two servers. The load sharing mode of operation is best suited to deployments where both servers in a failover relationship are located at the same physical site. Both servers respond to DHCP client requests based on the load distribution ratio configured by the administrator. See the following examples. In the following example, two DHCP servers simultaneously provide IP addressing to clients on a single subnet. In the following example, two DHCP servers simultaneously provide IP addressing to clients on multiple subnets. This test lab demonstrates new DHCP functionality in Windows Server 2012. Two server computers and one client computer are used. See the following figure. Two server computers and one client computer are required to complete the test lab. Two computers that meet the minimum hardware requirements for Windows Server 2012. Number of servers: DHCP failover is not supported for more than two DHCP servers. The failover relationship is always comprised of two DHCP servers. Domain membership: In this guide, DHCP servers are domain member servers. 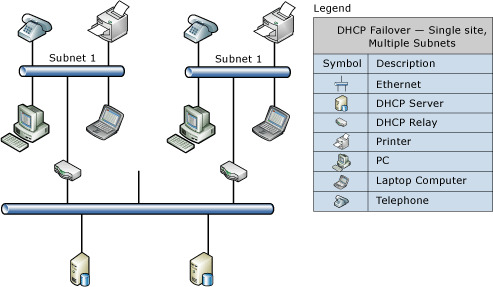 You can also configure DHCP failover on workgroup computers. Time synchronization: For DHCP failover to function correctly, time must be kept synchronized between the two servers in a failover relationship. Time synchronization can be maintained by deployment of the Network Time Protocol (NTP) or any alternate mechanism. When the failover configuration wizard is run, it will compare the current time on the servers being configured for failover. If the time difference between the servers is greater than one minute, the failover setup process will halt with a critical error instructing the administrator to synchronize the time on the servers. Configure DHCP1: DHCP1 is a domain controller, DNS server, and DHCP server for the contoso.com Active Directory domain. Domain controller and DNS server roles are not required for DHCP failover. These roles are installed on DHCP1 to mimic a domain environment. DHCP failover can also be configured on a workgroup computer (not demonstrated in this test lab). Configure DHCP2: DHCP2 is a DHCP server and domain member computer. Configure Client1: Client1 is a DHCP client computer. It is not necessary to configure a DHCP scope on DHCP1. A DHCP scope will be configured automatically when a failover relationship is created with DHCP2. 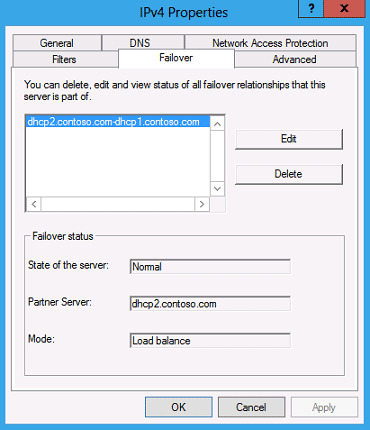 DHCP1 will serve as a domain controller, DNS server, and DHCP server for the contoso.com Active Directory domain. The Server Manager Dashboard is displayed by default. In the navigation pane, click Configure this local server. Select the DHCP Server checkbox. Click Next five times, and then click Install. Wait for the installation process to complete, verify on the Installation progress page that Configuration required. Installation succeeded on DHCP1 is displayed, and then click Close. Click Next four times, verify that All prerequisite checks passed successfully is displayed, and then click Install. Sign in using the local Administrator account. A domain administrator account is required to configure settings in the test lab. So that DHCP1 can be configured as a failover partner, it must be authorized in Active Directory. On the Server Manager menu, click Tools and then click DHCP. In the DHCP console, right-click dhcp1.contoso.com and then click Authorize. Refresh the DHCP console and verify that DHCP1 was successfully authorized. 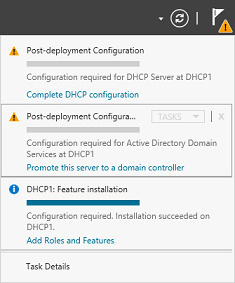 In the DHCP Post-Install configuration wizard, click Commit and then click Close. 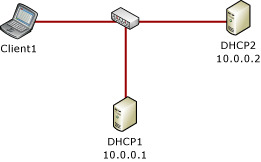 During the demonstration portion of the test lab, DHCP2 will be used to create a failover relationship with DHCP1. The procedure below is identical to the steps used to install the operating system and configure TCP/IP on DHCP1, with the exception that DHCP2 is configured with an IP address of 10.0.0.2. DHCP2 is a domain member server running the DHCP Server role service. On the Computer Name tab, click Change and then type DHCP2 under Computer name. Wait for the installation process to complete, verify on the Installation progress page that Configuration required. Installation succeeded on DHCP2.contoso.com is displayed, and then click Close. Click Next and then in Lease Duration under Limited to enter 0 Days, 0 Hours, and 2 Minutes. This very short lease duration will simplify the DHCP failover demonstration. In the DHCP console tree, right-click dhcp2.contoso.com, and then click Authorize. Refresh the view in the DHCP console and verify that DHCP2 is authorized and that the Contoso-scope1 is active. Client1 is a computer running Windows® 8 that is acting as a DHCP client. During the demonstration portion of the test lab, Client1 will be used as a DHCP client. The DHCP failover demonstration on Client1 makes use of Windows PowerShell to verify DHCP lease information. To make Windows PowerShell more easily accessible, it will be pinned to the taskbar. The Start menu is displayed by default. If Start is not displayed, move the mouse cursor to the lower left corner of the screen until Start is displayed, and then click Start. Type power and then under Results for “power” right-click Windows PowerShell and then click Pin to taskbar.Confirm that Windows PowerShell is pinned to the taskbar. Client1 can also be joined to the contoso.com domain, however this is not required to complete the test lab. 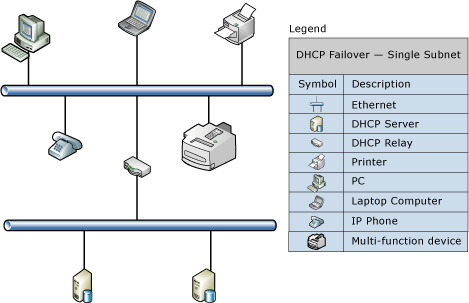 For the DHCP failover demonstration portion of the test lab, a failover relationship will be created using DHCP1 and DHCP2. First, configure a failover relationship using DHCP1 and DHCP2. On DHCP2, open the DHCP console, right-click the Contoso-scope1 DHCP scope and then click Configure failover. In the Configure Failover wizard, click Next. 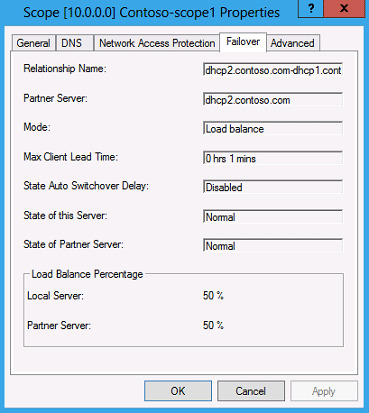 In Specify the partner server to use for failover, next to Partner Server, type dhcp1.contoso.com and then click Next. 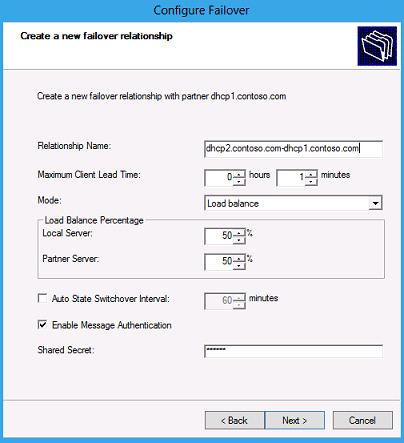 In Create a new failover relationship, type a name next to Relationship Name, or accept the default name that is displayed (dhcp2.contoso.com-dhcp1.contoso.com). Type a shared secret for this failover relationship next to Shared Secret (ex: secret). Change the value next to Maximum Client Lead Time to 0 hours and 1 minute. The Maximum Client Lead Time (MCLT) is additional time provided to a DHCP client after expiration of a DHCP lease. The MCLT is transmitted from the primary to the secondary server in the CONNECT message, and is the maximum amount of time that one server can extend a lease for a client beyond the time known by the partner server. The 1 minute MCLT value used here is for test lab purposes only, to prompt lease renewal by the client. In a production environment, you should use a longer MCLT, such as 1 hour. Review the options available in the drop-down menu next to Mode. You can choose Load balance or Hot standby. By default, Load balance mode is chosen. Verify that failover configuration was successful, and then click Close. On DHCP1, refresh the DHCP console and verify that the same DHCP scope configuration that is present on DHCP2 is now present on DHCP1. After you configure a failover relationship on a DHCP server, details for the failover relationship are displayed in the DHCP console. 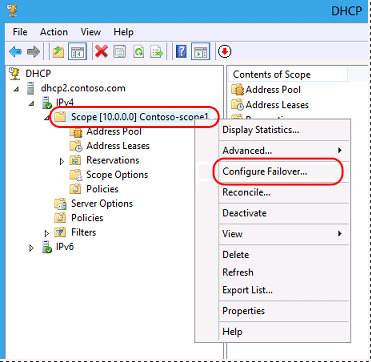 On DHCP1 or DHCP2, in the DHCP console, right-click the Contoso-scope1 DHCP scope and then click Properties. Click the Failover tab and review the information displayed. Verify that Normal is displayed next to State of this Server and also next to State of Partner Server. 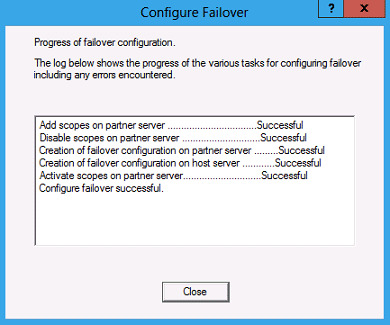 Note that you can edit or delete the failover relationship. Click Edit and review properties of the failover relationship that are available to edit. Leave the dialog box open for the following procedure. To demonstrate dynamic load balancing properties of the failover relationship, the load balancing percentage will be changed for an active DHCP scope. On Client1, click Windows PowerShell and type the following command. In the command output, note the DHCP server that is currently supplying an IP address configuration to Client1. The IP address of the DHCP server is displayed next to DHCP Server. In the View/Edit Failover Relationship dialog box DHCP1 or DHCP2 that was opened in the previous procedure, change the values under Load Balance Mode next to Local Server and Partner Server so that 100% is assigned to the DHCP server that is currently not supplying an IP address to Client1. The server that is currently supplying an IP address to Client1 will have a value assigned of 0%. Click OK twice, wait until the current DHCP lease is expired on Client1, and then type ipconfig /all again at the Windows PowerShell prompt. Note that the DHCP server that is supplying an IP address configuration to Client1 has changed to the server that you assigned 100% weight in load balancing mode. To demonstrate hot standby mode, the DHCP Server service on one of the failover partners will be stopped. Click Edit and then choose Hot Standby Mode. Depending on which DHCP server you are configuring, the local server will be assigned either Active or Standby status. The status is displayed next to Role of this server. The server that is designated to be Active in hot standby mode is the server that you used to create the failover relationship. Click OK twice and then wait 2 minutes for the DHCP lease on Client1 to renew. On Client1, type ipconfig /all at the Windows PowerShell prompt and verify that the server that is assigned as Active is supplying an IP addresses configuration to Client1. In the DHCP console on the DHCP server that is marked as Active for the hot standby failover relationship and is currently supplying an IP address to Client1, right-click the server name, point to All Tasks, and then click Stop. Verify that the DHCP service is stopped on the active DHCP server. Wait for the DHCP lease to renew on Client1, type ipconfig /all at the Windows PowerShell prompt, and verify that the standby DHCP server is supplying an IP address to Client1. Simple: A wizard is provided to create DHCP failover relationships between DHCP servers. The wizard automatically replicates scopes and settings from the primary server to the failover partner. Flexible: DHCP failover can also be configured for load balancing, with client requests distributed between both DHCP servers in a failover relationship based on the values you choose. Seamless: DHCP servers share lease information, allowing one server to assume responsibility for servicing of clients if the other server is unavailable. DHCP clients can keep the same IP address when a lease is renewed, even if the lease is issued by a different DHCP server.